Here are some photos from Wednesday's Clackamas-Barlow Mt. Hood Conference girls' soccer match at Clackamas High School. 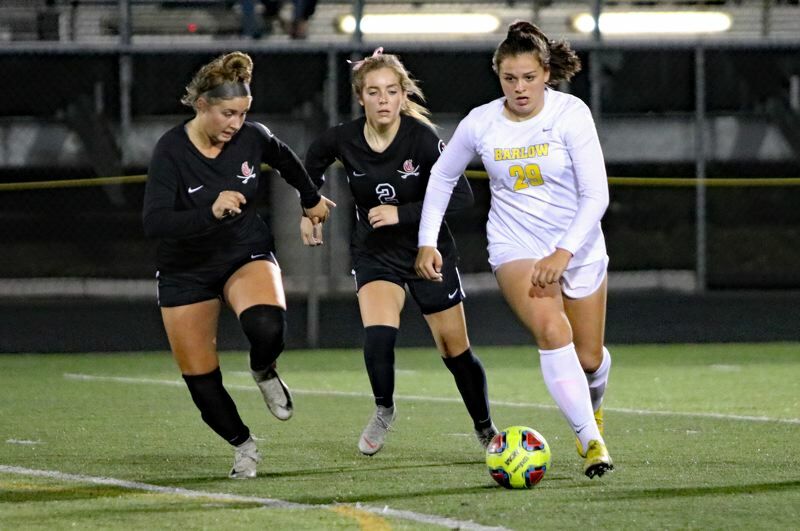 Clackamas' Kyla Sullivan and Emma Anderson scored goals about a minute apart in the first half, and then scored goals about nine minutes apart in the second half, leading the Cavaliers to a 4-0 victory over the previously unbeaten Bruins. Peyton Mongelli, Ellie Gentry, and Madeline Tetz earned assists for Clackamas (7-2-1, 3-0 Mt. Hood), while Cavs' keeper Hallie Byzewski registered her fifth consecutive shutout. Barlow (8-1-1, 2-1) had its nine-game unbeaten streak snapped a dropped a game behind league co-leaders Clackamas and Sandy with four games remaining in the regular season.